When I came across the chocolate marshmallows at Super WalMart I knew that something amazing was going to be in the crock pot in the VERY near future. I kept racking my brain on what to make. A cake with gooey marshmallows in the middle, hot chocolate that would be topped with the new finding, nut candy with chocolate and the new marshmallows????? OH! Decisions, decisions. After grabbing a box of cocoa rice krispies and some chocolate chips I knew it was going to be a triple chocolate crock pot treat. 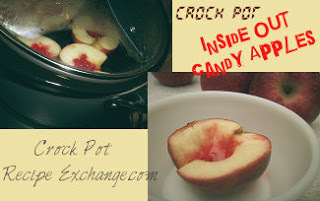 Turn a 6 quart crock pot to high. Place butter in crock pot to be melting. After completely melted add the marshmallows. Stir to coat marshmallows to keep them from sticking while melting. Let marshamllows melt completely (takes about 45 minutes – 1 hour) stirring constantly. 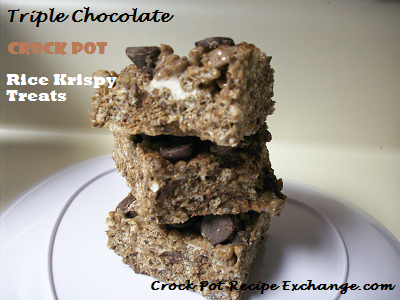 Add 1/2 cup of chocolate chips and stir to melt and incorporate. Turn crock pot off and remove crockery to pot holders on top of countertop. Add cereal and stir to coat and incorporate thoroughly. Press mixture into greased or wax paper lined baking dish or cookie sheet. Evenly sprinkle remaining chocolate chips on top of mixture, pressing down so that chocolate chips will stay attached once you cut treats. Let sit for at least 1 hour and then cut into bars.